The primary subject of this work is the paint itself. Replacing a brush with the action of pouring allows the paint to flow and resist of its own accord. 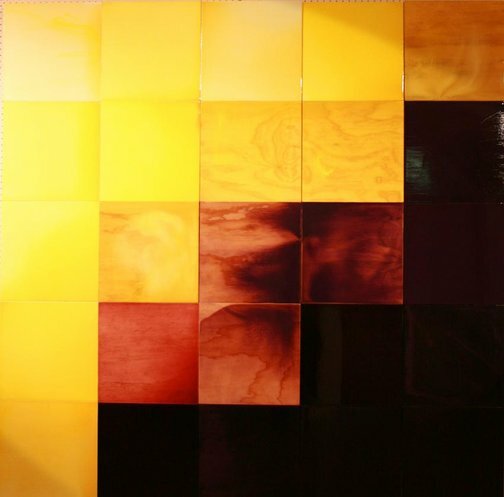 The contrasting hues of purple and yellow contradict one another; however, the reflective surface unites the panels into a singular work. The wooden panels create the grid that divides the image. The natural grain within the boards creates a very powerful image of its own. On close viewing the panels begin to reflect the audience, encapsulating the audience within the industrial chemicals allowing the abstract piece to become figurative, drawing a likeness to a portrait. The work explores the harmonious transposition between the colour, and thus creates a peaceful continuum.